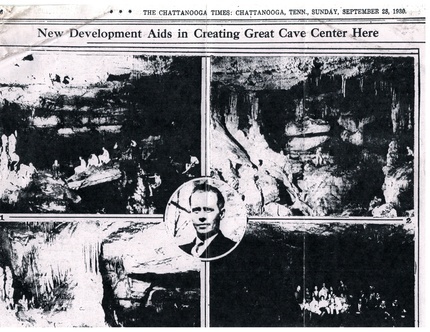 Raccoon Mountain Caverns was discovered in 1929 by famed Chattanooga area cave explorer, Leo Lambert. The property had been the farm for the restaurant of the Grand Hotel which was located in downtown Chattanooga. The farmers would enjoy sitting in front of the rocks at the base of Raccoon Mountain on a hot afternoon in order to enjoy the cool breeze which was blowing out from several cracks. Mr. Lambert was invited to explore the cracks and he enlarged the small opening so that he could enter and explore. He was amazed at what he found and decided to open the cave for its first commercial tour on June 28, 1931, in the midst of the Great Depression. Mr. Lambert originally named the cave the "Tennessee Caverns." The name was later changed in the 1950s to "Crystal City Caves" and then to "Crystal Caverns" in 1973. The name was again changed in 1978 to our present name, Raccoon Mountain Caverns, when the Tennessee Valley Authority (TVA) started to develop a hydroelectric facility several miles away. 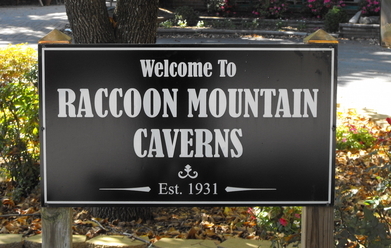 Raccoon Mountain Caverns has the oldest and most respected wild cave adventure tours in the south. We began to offer these unique tours after the discovery of over 5 miles of additional passageways in the 1950s. Word of these tours spread and demand continued to increase into the early 1970s. By 1973, a formal Wild Cave program was established to train and certify guides so that these tours could be offered on a regular basis. We are proud to have been the first cave in the country to offer commercial Wild Cave adventure tours and remain the #1 cave in the South for them. Your tour builds on our heritage and will be led by a highly trained guide who will focus on safety, education and cave conservation. We provide all necessary equipment so all you have to bring are old clothes, a change of clothes, and an adventurous spirit. We hope that you will go caving with us!